Gain: VHF 28dB; UHF 32dB. Reception: VHF/UHF. Reception range: Up to 150miles. High Sensitivity Reception. 360 Degree Rotation by pushing the bottom o/. Passaggio DC su tutte le uscite. Passaggio DC:800mA. Perdita di passaggio 8,1dB 860MHz 9,5dB 2300MHz. Consulter la tv manuel pour des instructions détaillées. si vous utilisez un plat HDTV, s'il vous plaît passer par votre TV manuel à assurez-vous que votre TÉLÉVISEUR est livré avec haut-tuner tnt pour. 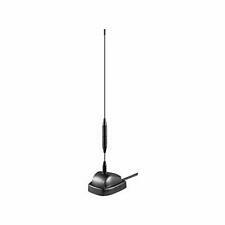 Ingressi BI / FM ( 40-108 MHz) _ BIII / DAB ( 160-260 MHz ) _ UHF1 (470-862 MHz) _ UHF2 (470-862 MHz). Non è progettato per l'utilizzo in spazi aperti. L'unità richiede una ventilazione naturale, in modo che non devono essere coperti da alcun oggetto. 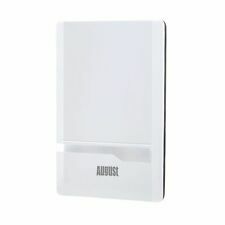 Type: TV Indoor Antenna. Enjoy watching thousands of channels with your family in vivid HD & digital signals. 1 x Clear TV Key Antenna. The Free TV Key Receives HD 480p-1080p channels with no contracts or monthly bills. Amplificatore di segnale per TV digitale terrestre e via cavo. Prodotto ideale per la vostra casa, può essere usato in qualsiasi luogo dove il segnale del digitale terrestre sia debole o poco chiaro. 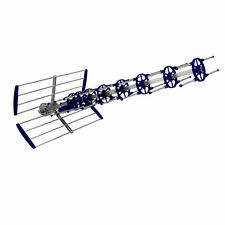 This aerial is designed specifically for high definition digital reception. Small, compact and lightweight, it is perfect for portable TVs and USB TV tuners, you can easily carry it in your laptop bag or TV case without worrying about extra weight or space. Reception: VHF/UHF/FM, Free HDTV 720p, 1080p. 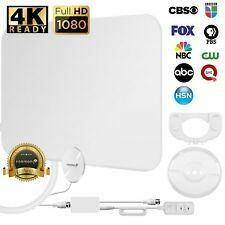 1x HDTV Rockford antenna with built-in roter & amplifier. Power: AC15V 300mA. Power outlet is not required outside where the antenna is mounted. Rockford 250 Miles High range outdoor TV antenna, 3 Years Warranty! Get free access to all the content available in your area, including the most popular over-the-air TV shows, news, sitcoms, kids programs, sports and much more, all in breathtaking 4K Ultra HD for the best picture quality, most vivid colors and stunning sound. WITH PRINTED CIRCUIT BOARD. Fits any UK single gang back box. Easy Fit - No Soldering. One Coax F Type IN to Two Coax F Type OUT. 1x 2 way Coaxial sky virgin Splitter. Professional High Grade Splitter. Compact splitter for UHF/VHF/FM signals. Can be used to split TV or Radio signals. Split one signal going to Two TV's. The amplifier is specifically designed to boost DVB-S signal for long cable runs where signal is week or need to be divided for several devices. It increases DVB-S up to 16-20dB. Works in 47-2300MHz. È possibile unire 2 supporti per istallare 3 o piu lnb. iban IT40 J010 1040 0311 0000 0000 815. Burst Brick Hole Cover. So you have drilled your hole through the wall and cracked the brick! Simply fasten to the wall over the hole with Silicone etc. Or got an ugly hole where the cable goes in. No Problem, Use this. 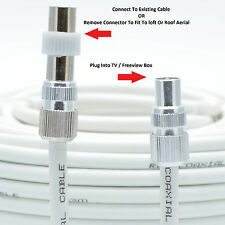 Flat twin indoor dipole aerial free male coax adapter. FM Radio Dipole Aerial. Dipole length: each approx 80cm. for VHF/FM radio reception. Reception bandwidth: 88-108 Mhz. Antenna esterna omnidirezionale attiva con base magnetica. Si prega di essere pazienti. Molto facile da installare. Lunghezza del cavo : 3.5 m e 1.5 m. Angolo di ricezione : 360 °. Passaggio DC su tutte le uscite. Passaggio DC:800mA. LiveWave TV Antenna Digital HDTV Up to 800 Channels Save. 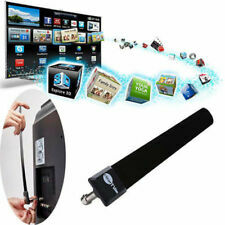 LiveWave TV Antenna Digital HDTV Up to 800 Channels Save. . Shipped with USPS Priority Mail. I have 2 one is opened but the other is sealed still. Unispectra presents - New, crafted to perfection mini log periodic aerial L2008UF - YouTube. Iban IT40 J010 1040 0311 0000 0000 815. INSTALLAZIONE - Per la ricezione delle emittenti radio FM o AM è necessario installare una piccola antenna. In una imbarcazione l'antenna FM/AM può essere installata in modi diversi, questi quelli più usati: Si usa un'antenna FM/AM con uscita a fili liberi che si faranno scorrere lungo la paratia e verso l'alto. This Outdoor Antenna has an Outstanding Reception of high-quality programming. 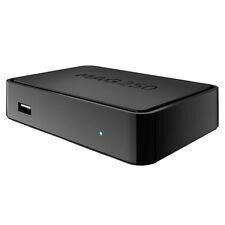 It has 20-28dB Gain and a range of 150 miles that will allow you to watch your favorite shows in full 1080p for free! 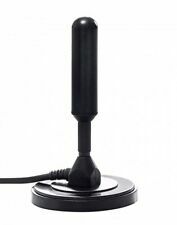 It is designed to receive Digital TV UHF/VHF signals and provides the highest quality picture available. The IMAGE 420 antenna breaks new ground and represents the latest in directional antenna design.This new concept combines a powerful computer designed antenna array that provides performance normally associated with much larger antennas. Yet its semi-enclosed streamlined fuselage, provides IMAGE with its modern, stylish and distinctive profile. 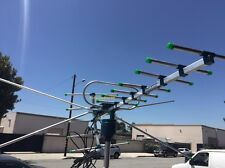 The aerial can be used either horizontally or vertically,as shown in the images.It is also very quick to remove and put away with just one screw holding it to the mast (please note mast not included). Latest model with 4G fltering as standard. Compatible: 720p, 1080i, 1080p / ATSC. Reception range: 200 miles. Project Type: TV Antenna / p. TypeTV Antenna. ModelTV Antenna. 1 TV antenna. Signals ReceivedFreeview, Freeview HD, UHF, VHF. Connector: TV Male. LiveWave TV Antenna Digital HDTV Up to 800 Channels Free Save $ Dump Cable . Condition is New. Shipped with USPS Priority Mail. Just add your own aerial onto the mast, Maxview aerials have the pre-drilled compatible hole but if you use your own aerial you may have to drill the hole. Mast with integrated mast adaptor. Mast length 54cm (20” approx.). CARAVAN CAMPER BOAT TV DIGITAL FREEVIEW BOOSTER AERIAL. THE BUILT-IN AMPLIFIER GIVES YOU A CLEAR PICTURE EVEN IF THE RECEPTION SIGNAL IS WEAK. SPECIALLY DESIGNED FOR CAMPING AND MARINE USE. FEATURES A SPLITTER TO CONNECT A SECOND RADIO OR TV SET. Mast with integrated mast adaptor. Mast length 54cm (20” approx.). Aerial length 55cm (20” approx.). Receives all available digital terrestrial TV signals including Freeview and Freeview HD. Compact size benefits both storage and transportation. Sky & Freesat. Sky Dishes. Twin Type Cable Clip. Compatable with sky, sky , sky HD, Freesat, Freesat HD. Includes 2 x F-inline connectors to connect to existing cables for moving your sky or freesat box. 20 x F compression connector 5mm, 3,9. Filtro: LTE: 791 ÷ 862 MHz. Attenuazione: LTE: < 20dB. Attacco: F. Impedenza: 75 Ohm. The Truvision (C3010) UHF TV aerial is manufactured by the industry renowned Maxview brand, a British company who have been making TV aerials since 1964, so they know what they are talking about! The aerial has a striking contemporary free-standing design which simply flips up into position and is ready to use straight out of the box for digital TV signals. Easy finger tip adjustment allows horizontal or vertical alignment for optimum signal reception. Fitted with an integrated tilt pivot which allows the aerial to be re-positioned to receive horizontal and vertical signals. Channel Master 3041 DSB VHF UHF HDTV Antenna Preamplifier NOS. Condition is New. Shipped with USPS Priority Mail. Single input Dual band vhf/ uhf Gain UHF 23db VHF 16 DB Low noise Mast mounted I acquired a bunch of these new old stock premium channel master preamps. Get a great performer for a great price!! TV Aerial Wall Mounting Kit - Cranked Offset Pole / Mast & Outdoor Bracket. Straight mast made of superior extruded aluminium alloy suitable for all aerial installations. ALLOY TV AERIAL MASTS. WALL BRACKET KIT. 200 x F compression connector 5mm, 3,9. INCLUDING DC CABLE 2M. WITH RUBBER “O” RING FOR SUPERIOR LOCKING. Freeview & Aerial. 50 X Male TV Aerial Coax Cable Connector. Aerial Cables. Male Tv Coax Connectors. Suitable For All 7mm Coax Cable. Fits All 7mm Coax Cables. Magic eye TV Links. Twin Type Cable Clip.